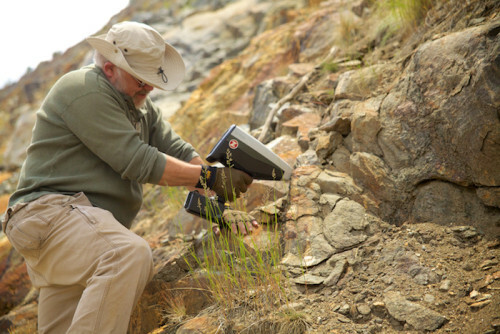 The range of SciAps field portable products allows a wide variety of diagnostic information to be collected on geological samples. The combination of geochemistry and mineralogy provides a powerful tool for understanding geological materials in the context of their environment. 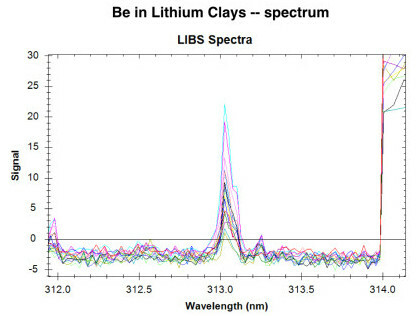 LIBZ Laser Induced Breakdown Spectroscopy Field Testing for Even the Lightest of Elements: Na, Li, C, Mg, N, Be Detailing 50μ Spots or Averaging Over Large Areas. UV-VIS-NIR Spectroscopy 350-2500nm Mineral Mapping & Exploration High Speed Measurement with No Sample Preparation Raman Spectroscopy 1030nm Nondestructive Analysis for a Wide Range of Minerals & Compounds Examination with Optional XY Stage and Video Microscope. More Elements Analyzed for Better In-field Geochemistry. The Z measures elements beyond the reach of any other handheld technology. These “major elements” plus trace elements and base metals constitute significant components of the main mineral phases and allow discrimination between mineral groups. SciAps LIBZ technology provides key low atomic element chemistry for common geochemical ratios. 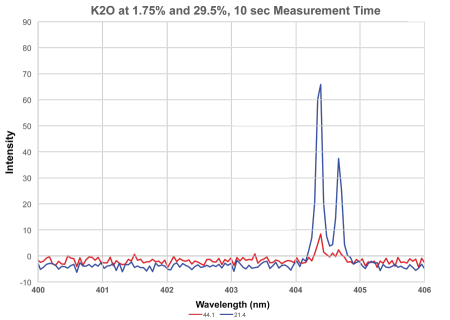 Shown in the figures below are spectra for elemental Calcium (Ca), sodium (Na), and Potassium (K) . These elements are easily measured in seconds in geochemical samples, along with transition, heavy metals and low atomic number elements Li, Be, B, C and others. 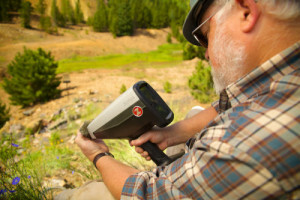 Measure Li (lithium) to very effectively to discriminate mica group minerals. 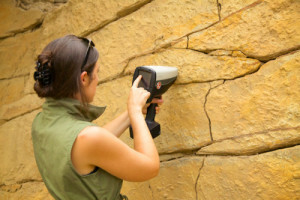 Measure Be, B and other trace elements to understand Pegmatite’s relationships to Granitoids, especially with Pegmatite’s a potential source of rare-earth elements (REE’s). Of course, the Z also analyzes common base metal including Cu, Mg, Al, Mn, Fe, Ti, Ni, U and other commercially sought metals. In many cases, detection limits are superior to other handheld technologies due to the ease of laser-based excitation. 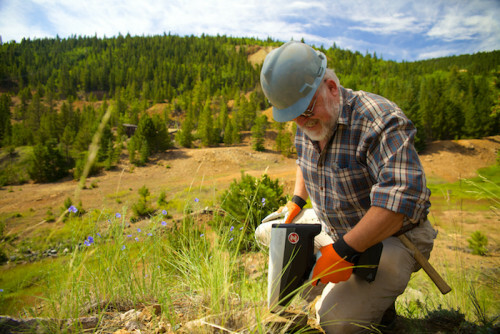 The Z is the first ever handheld LIBS analyzer to quantitatively measure elements in soil. Results from some preliminary measurements are shown below. Our Applications Lab is receiving samples from many exploration sites globally, and new data will be posted regularly, provided customer consent is granted. The test method required 6 second tests at a specific location on a sample. Due to inhomogeneities in the sample –even when prepared – typically 5 tests are taken, and the analyzer software provides the average and standard deviation for each element detected. The variability in the data below is therefore a blend of intrinsic precision of the LIBZ technique, and unavoidable sample non-uniformity. The Z rasters the eye-safe laser, which has a 50 um diameter (approx.) over a 3 mm diameter sample region. The beam must be rastered in order to average out even small sample in-homogeneities. Also, it is not possible to repeatedly fire the laser at the same location, because each laser pulse creates a plasma and small crater on the surface of the soil. Subsequent laser pulses must strike a different location on the soil sample. Therefore, the laser is rastered over 60 locations during the 6 second test period. 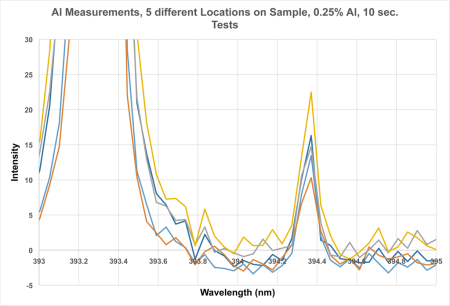 Gated spectra are collected at each location, and averaged for the test result. It is possible to also examine the elemental intensities and intensity ratios at each beam location. The Z LIBZ technology uses an eye-safe laser and meets Class 1M standards. Travel freely anywhere in the world, without licensing, registration, or burdensome documentation. No safety training or certifications required. Google Android Powered for Instant, In-field Analysis – with Global Connectivity. Tap the SHARE icon, pick a device – including your cell phone Hotspot. Then instantly create a test report or export data. Print, or email data anywhere, right from the Z. The Z’s camera, and the 50 um laser, can hone in on particular regions for non-homogenous samples. Or save sample pictures for photo-documentation. 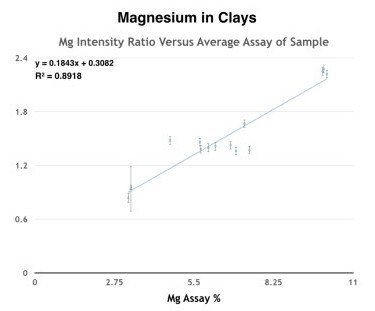 The first figure shows results for Mg concentrations ranging from 3-10% in clay samples. The data trends well. The error bars are largely driven by non-uniformity in the sample. 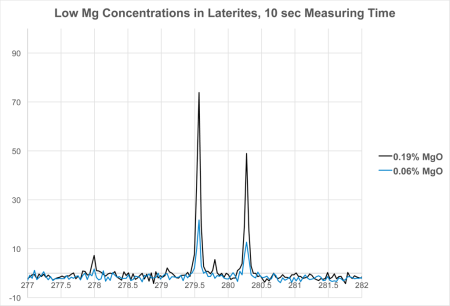 The second figure shows two Mg spectra from laterite samples. As shown, detecting even very low concentrations of Mg in soil with fast tests is a strength of LIBS technology. Shown are the Mg lines for concentrations of 0.06% Mg (blue) and 0.19% Mg (black). 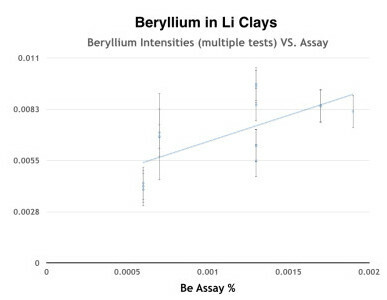 For several lithium clays, laboratory assays for beryllium (Be) ranged between 6 and 19 ppm. 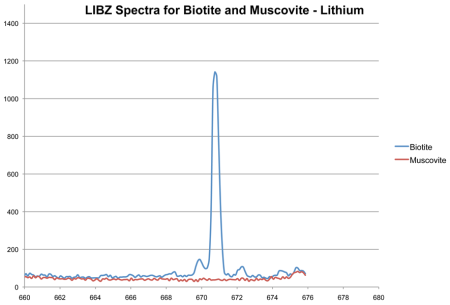 Shown first are the LIBS spectra for each sample. The doublet peak near 313.07 nm is clearly visible in all samples. The results of intensity ratios versus assays are shown as well. In this case, the result of each test is shown, rather than the average, to demonstrate the deviation due to inhomogeneity from different locations on the sample materials. 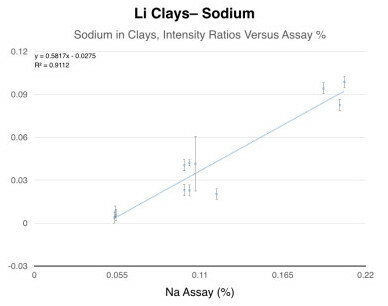 Shown are results for 4 concentrations of sodium (Na) in lithium clays, ranging from 0.05% Na up to 0.2%. The results from multiple tests on different sample locations are shown, to indicate the distribution. Also shown is an outlier result at about 0.12% Na. As with Be and Li, the Z is the only handheld technology capable of measuring concentrations of these low atomic number elements in geochemical samples. Note: All concentrations are for total % of element, not oxide form. 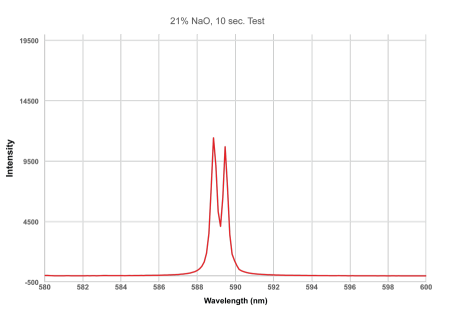 Shown are spectra and intensity ratios versus assay (provided more than 2 assays were available) for several elements in potash samples. The data show good quantitation for these elements – evidence that it is feasible to determine critical geochemical ratios in the field – such as Ca/(Ca + Na), K/Na, and aluminum-driven ratios A/CNK and A/NK. These can also be compared to silicon content. Sodium (Na): Spectrum for 21% Na content acquired in 10 sec. The Z measures Na in most geochemical samples to under 0.1%. 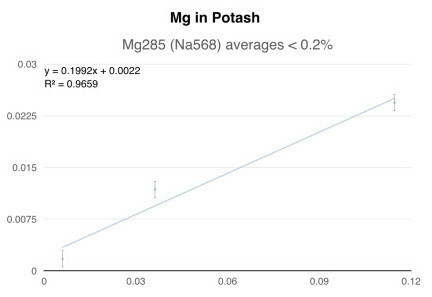 Magnesium (Mg): Data for a few assays of Mg in Potash. Mg detection is lower than 0.04%, and shows good trending with concentration. 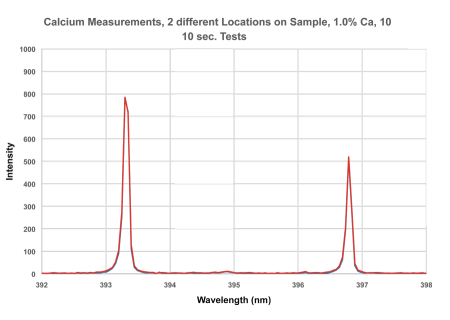 Aluminum (Al): Spectra for 5 repeats, different locations, on a sample with 0.25% Al. Even at low concentrations, the Al peak at 394.35 nm is clearly detected. 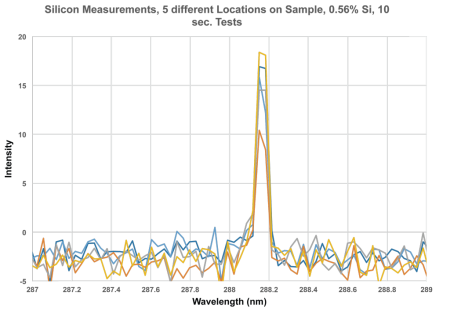 Silicon (Si): Spectra for 5 repeats, different locations, for 0.56% Si. 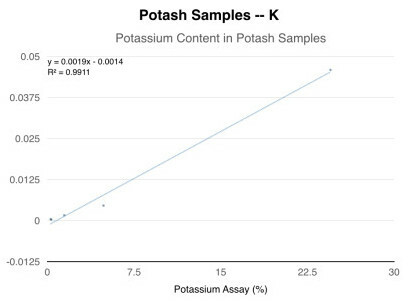 Potassium (K): Potassium results versus assay, down to about 0.2% K.
Calcium (Ca): Shown is the spectrum for 1% calcium content, tested in two different locations. Based on spectrum, calcium limit of detection is estimated about 100 ppm. For more information on The Z Geochem please visit our Knowledge Center.